* This is my article in BusinessWorld yesterday. One of the beauties of free trade and global economic integration is that countries can benefit from low commodity prices as improvement in technology and processes in other countries result in bigger output for the same land area and other inputs. The downside of course is that when commodity prices go up, economies that are more dependent on imported products would tend to wobble. 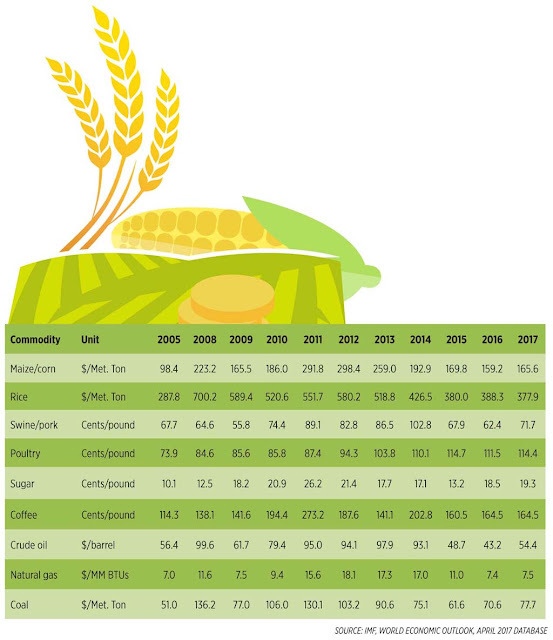 The period from 2008 to 2014 was characterized by generally high food and commodity prices. For instance, price of corn was only $98/ton in 2005 but it shot up to $223 in 2008. I think it was the momentum of the biofuels law in the US in 2005, spurring huge demand in the US, Brazil, other countries. The price mellowed in 2009-2010 during the global financial turmoil that started in the US, but shot up again to nearly $300 in 2011-2012. The global spike in rice prices (aka as “rice crisis of 2008”) from $288/MT in 2005 to $700 in 2008 was caused by several factors, among which are (a) price hikes in major energy sources oil, natural gas, and coal in 2008, and (b) rice export restrictions by India, Vietnam, Brazil, other countries. Among the reasons why world oil prices rose to record levels in 2008 was the high energy demand in the two biggest countries in the world in population, China and India. Prior to 2008, from 2003-2007, China’s GDP growth was always double-digit, averaging 11.7% per year. India’s growth during that period was also high, averaging 8.8% per year. 1. Rice trade liberalization should have been started in 2010 when the Aquino administration took power. After short price spikes in 2011-2012, rice prices went downhill. The Duterte administration should proceed with full rice liberalization this year because of high medium term outlook for rice output and exports by our neighbors, Thailand and Vietnam especially. 2. Sugar liberalization should be pursued too as world sugar prices have declined from their peak prices in 2010-2012 average of around 22 US cents per pound. 3. Trade of corn and swine, even poultry should also be liberalized. Prices of rice, corn, swine, poultry and other food products are among the major contributors of the overall consumer price index (CPI) which are used to compute the inflation rate. 4. Energy-intensive industries like manufacturing, hotels, construction, and transportation (on air, land, water) can expand their production and fleet to take advantage of lower prices of oil, natural gas, and coal. 5. Two hindrances here: (a) the planned hike in excise tax for oil products by P6/liter across the board, and (b) continued onslaught by feed-in-tariff (FiT) and soon, renewable portfolio standards (RPS) that will result in expensive electricity. The purpose of trade and energy revolution is to make global energy prices become cheaper. The purpose of government in this case to make cheaper energy more expensive. These two measures should be abandoned and reversed someday. 6. Among the ASEAN-6 big economies (Indonesia, Malaysia, Thailand, Singapore, Vietnam and Philippines), the Philippines registered the highest average GDP growth per year from 2010-2015: Thailand 3.7%, Indonesia and Malaysia 5.7%, Singapore and Vietnam 6.0%, and Philippines 6.2%. There was something good that the previous Aquino administration was doing that the new Duterte administration should somehow continue. Bienvenido S. Oplas, Jr. is the head of Minimal Government Thinkers and a Fellow of SEANET. Both institutes are members of Economic Freedom Network (EFN) Asia.